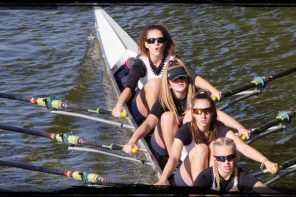 Henley Rowing Club had a triumphant Henley Women’s Regatta with 3 wins in the junior women’s categories. The club entered 4 senior categories and 3 junior categories with high expectations following recent successes at local and national events. The Senior Women’s coxed four beat Bowdoin from the USA in the first round to head into Saturday’s quarter finals. In a thrilling race against Thames RC, the senior women were finally overcome by the London crew to lose by a length. The Senior Women’s single scull of Genevieve Bailhache-Graham progressed further through the competition following a significant win over Imperial College in the quarter finals. Facing a single sculler from Cardiff University in Sunday’s semi-finals, Bailhache-Graham sculled well in the opening stages of the race but was unable to maintain the pace and gain a final place for Henley. The Junior Women’s section continued their track record of leadership in the sport with a series of three wins to dominate the junior events. In the Girls coxed four, the crew of Ciara Buckley, Kryssie Steiger, Alexis Perkins, Emily Pimlott and cox Beth Pasco started their campaign with a clear win over local rivals Great Marlow School. Heading into the quarter finals on Sunday, they met old adversaries Bedford Girls School and again won in style. The Henley crew then moved the Portura crew from Ireland aside in the semi-finals to reach a final against Aberdeen Schools. In a commanding race in the Sunday sunshine, the Henley girls stirred up the supporting cheers from the local crowds, maintaining their unbeaten season at major regattas with a triumphant win over the Scottish crew by over three lengths. In the J16 coxed fours, the crew of Lauren Kay, Georgia Edwards, Maisie Turner, Emma Lister and cox Rebecca Lister had a point to prove to the field of 18 crews after a disappointing weekend at the National Schools’ Regatta in May. Following a successful time trial they entered the knock-out stages on Saturday with an early win against Bedford Modern School. In the quarter finals, they raced Bedford Girls School and won with a margin of 3 lengths. Sunday’s semi-final against St Paul’s USA was another outstanding win for Henley, with a 2 length margin at the end of the 1500m course. In the final against Lady Eleanor Holles School, the Henley crew were able to restore their leading presence in junior girls rowing with a perfectly executed race plan and clear power advantage to win by one and a half lengths. The J16 quad sculls event saw 2 Henley crews entered. 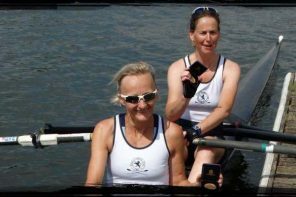 The National Schools’ Regatta silver medallist boat of younger J15 scullers Ella Morgan, Clare Pearson, Katy Claridge and Florence Wiggins were rowing up a year to compete in their first Henley Women’s Regatta. The girls sculled well through the time trial, and then performed outstandingly well against an older crew from St Neots. This performance was repeated in the quarter final against Warrington, leading them to a semi-final place against an unknown composite crew from Canford-Christchurch. 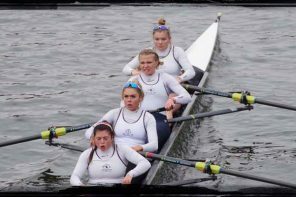 The composite crew took the early advantage from the start and despite ongoing pressure from the Henley girls, the composite secured their place in the final. The Henley J16 crew of Lauren Edwards, Maddie Orr, Ellie Thompson and Hattie Orr gave a magnificent demonstration of sculling with a overwhelmingly dominant series of performances against the field of 25 competitors. From the opening time trial, the first round win against Liverpool Victoria Rowing Club and the quarter final win against Nottingham Rowing Club, the Henley crew, unbeaten in their age group since January 2013, continued to show superior sculling. Meeting local rivals Headington School in the semi-final, the Henley girls flew off the start and with their first power push at 500m, they left the Oxford crew behind for the next 1000m to win comfortably. Racing the Canford-Christchurch composite in the final, the Henley girls moved ahead from the start in the run up to the booms, clearing the opposition by a clear length within the first 250m. 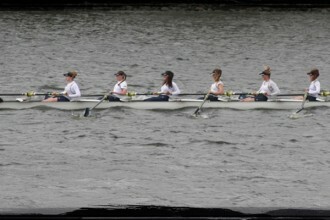 With continued pushes through the race, the Henley girls accelerated away to win by a clear margin of four lengths.